La Salada. Photo courtesy of Trumpet Wine. When it comes to the wines of Spain, I’ve found things can get oversimplified. I’ve been tableside countless times with a guest who says, “Oh, I love Spanish wine,” then immediately points to a Rioja on the list. Similarly, I often hear sommeliers say they don’t like Spanish wine. I understand that they’re referring those highly extracted, oaky Riojas and streamlined whites common to industrial winemaking. But both pioneering and up-and-coming importers of smaller-scale Spanish wineries will tell you this: There’s no logical way to lump the wines of this country together. In the past two or three years, I’ve encountered probably two dozen newer producers who debunk the notion of Spanish wine as a single “thing,” as ridiculous as speaking of “French wine” or “American wine.” While tasting the wines and discovering these new, often natural, producers in Spain, I found that, intriguingly, a great many of them are clustered in Catalonia. Increasingly curious, I decided to expand a trip I took to Barcelona last winter beyond the city itself. 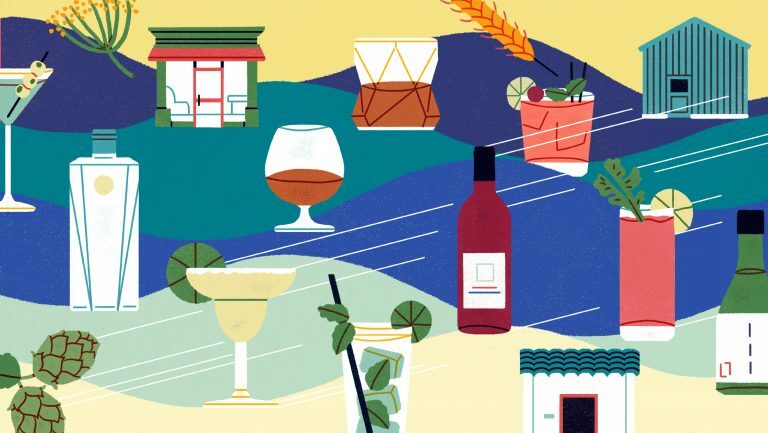 I wanted to poke around in the city’s wine lists but also to spend a day with a few of the new winemakers driving the change in the country’s wine scene. I took a day and drove southwest to Penedès—an hour-long trip during which one quickly experiences the geographical diversity of the region, from the low Mediterranean coast to the Catalonian Coastal Ranges, a series of green-black mountains that rise up in ridges between the coast and the plains. From every vantage in Penedès, these mountains form dark waves on the horizon; the appellation itself nestles in a valley between the two ranges. The hills are brown and white rock darkened by scrub, while the flats alternate between yellow squares of farmland and expansive stretches of industrial development. The white rock in the hills is significant—it is calcareous, old maritime soil. Dotted along many vineyards, it’s capable of lending a serious minerality to grapes grown here. In Penedès, I joined Toni Carbó and Ramón Jané, the friends behind Mas Candí and Celler La Salada, for a nearly four-hour lunch at a local restaurant, Cal Xim, before heading to the Mas Candí cellar. We tasted their bright, pure wines over artichokes, grilled fish, and xató, with plates of raw tomatoes, whole cloves of garlic, and olives as accompaniments. The conversation moved from wine to Penedès, Catalonia, and the world in general. Carbó’s partner had joined us for lunch; with some feeling, she asked: “Do Americans know about us?” I wasn’t sure what she meant, so it was clarified: Do Americans know that some Catalonians want their independence, how separate many see themselves from the rest of Spain? This emphasis on Catalonia’s difference from the rest of Spain currently seems to express itself in the wine culture of Catalonia in shifts in three notable particulars: grape varieties emphasized, winemaking style, and farming practices. For some decades, with the influence of global wine styles like Bordeaux and Napa Cabernet in the 1980s and ’90s, plantings in Catalonia of international grapes like Merlot, Cabernet Sauvignon, and Syrah gained a foothold. Saturated, oaky styles of red wine dominated, exemplified by modern Priorat or Montsant tintos. Now, however, many of the younger winemakers prefer indigenous varieties; they often work exclusively with native grapes like Xarel-lo, Macabeu, Garnatxa Blanca, and Parellada, along with indigenous reds like Garnatxa, Monastrell, and Trepat. Among the new guard, the winemaking style is moving away from Rioja-emulating, modern reds—more toward freshness, acidity, and finer structure. And finally, a growing number of small producers have rejected industrial farming in favor of organic and biodynamic practices. Carbó and Jané’s wines reflect this streak of independence and changing practices; the friends’ vision is representative of the wider shift in the region, marked by their departure from emphasizing Cava as the only serious wine in Penedès. The duo produces several still whites and reds from indigenous varieties; Carbó laughed when describing the difficulties in trying to sell or explain several different bottlings of still Xarel-lo to his neighbors. (He rendered their perplexity this way: “Why would you make still Xarel-lo when you could farm with far less labor and cost and sell your fruit to Cava factories—let alone make two different cuvées of Xarel-lo and two more still whites besides?”) At Mas Candí the focus is on old-vine fruit, farmed biodynamically—an especially striking departure in Penedès, where mechanized production of grapes to sell to Cava houses has dominated the landscape for decades and has, indeed, been one of the only viable means of survival for farmers in the area. A couple bottlings are indicative of Mas Candí’s difference from the cheap-Cava norm. QX is a white cuvée that comes from four of the winery’s best plots of Xarel-lo. The wine is divided among four varieties of wood for aging: American oak, French oak, chestnut, and acacia. Full-bodied and ripe but with shivering acidity, QX has delicate notes of florals, citrus rind, and seashells; it’s destined for lovers of great Chablis. Mas Candí does produce Cava, in a nod to tradition, but the Cavas are made in tiny quantities with an attention to the terroir of specific vineyard parcels—more like grower Champagne than the jug stuff you’ll get in the Gothic quarter tapas traps in Barcelona. Mas Candí’s standout Cava is Segunyola, a single-vineyard bottling with an explosive herbal nose and a palate of salt and metal. But Mas Candí isn’t the only banner for change in Penedès, which is one of the largest land-area DOs in Catalonia. Since its inception, Recaredo, a family-owned Cava house founded in 1924, has been dedicated to organic practices, dry farming, and strictly zero-dosage and vintage Cava. (Its Brut Nature Gran Reserva rosé, Intens Rosat, is one of the most savory, relentless sparkling wines I know.) But Recaredo is a notable exception to the norm; many of these practices have only gained serious traction since the early 2000s, as more young producers have begun to forgo the industrial methods and reinterpret Catalonian tradition. 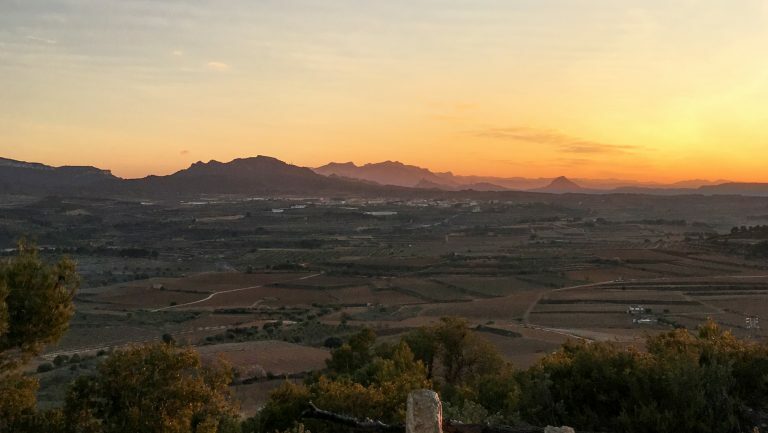 Of course, one of the difficulties in detailing these trends in Catalonia is that Penedès, as the more famous appellation with proximity to Barcelona, often gets all the shine, but it’s not the only subregion to express extraordinary change. 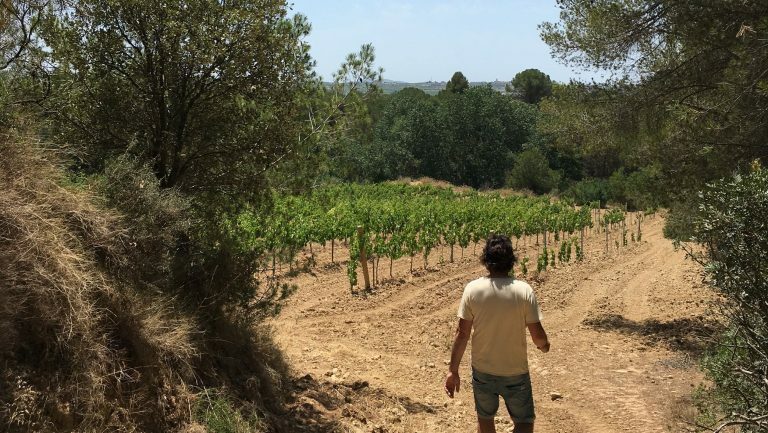 In Terra Alta, a high and dry pocket of Catalonia, hot summers, cold nights, lots of wind, and rocky, well-draining soils combine to form very favorable growing conditions. Yet since around the 1920s, the DO has been dominated by generic local wines produced by co-ops. Some of this has to do with Terra Alta’s geographic isolation. Some of it has to do with the legacy of the brutal Spanish Civil War in the 1930s, in which fighting occurred in the area, leaving destruction and poverty behind. Since 2009, however, a new producer in the little-known DO has signaled an uptick in quality and individuality in wines of the region. Francesc Ferré of Celler Frisach is a joyful, whip-smart young winemaker in the old town of Corbera d’Ebre. He’s already caught plenty of attention at home in Catalonia, landing his wines, by the glass, in restaurants like Albert Adrià’s lauded Tickets. We met in New York this past March; I’ve been consistently impressed with the vivacity of his wines and with Ferré’s ability to articulate enology so well—especially given that he’s currently fairly alone in his pursuit of new practices in rural Terra Alta. Frisach. Photo courtesy of Trumpet Wine. Ferré’s family farmed organically in Corbera d’Ebre for 200 years but never made its own wine. Today, from the family’s old-vine parcels, Francesc makes fresh, vivid wines, the type that really don’t feel like they’re from the hot Iberian Peninsula. His Vernatxa, a 100 percent Garnatxa Blanca, is a layered white wine full of herbal, zesty notes—oregano, kaffir lime, melon rind. Celler Frisach also produces an intense red cuvée that speaks to both historical varieties and wider local history; it’s a blend of Garnacha Fina, Garnacha Peluda (the peculiar “hairy Grenache”), and Cariñena. Called Sang de Corb—blood of the crow—the cuvée makes reference to the three generations of the Ferré family, or “crows,” who have lived and died since the Battle of the Ebro, which tore through Francesc’s hometown and his family’s land in 1938, Francesc told me that shrapnel and detritus from the war can still occasionally be found in the vineyards, some 80 years later. To my eye, young and newer vignerons like Francesc Ferré, Toni Carbó, and Ramón Jané are a clear expression of how Catalonia is evolving, as they rapidly shift the quality and style of the region’s wines away from an industrial past. The questions they pose for our understanding of what “Spanish wine” is, and the influence they are likely to have on the rest of their country, lend real excitement to the prospect of what we’ll get to drink from Catalonia and the rest of Spain in upcoming years. Look increasingly for wines from appellations rarely seen, with a quality much higher than we’ve expected, as new energy, revitalized farming practices, and experimentation are devoted to old terroirs in this independently minded place. Enric Soler is a thoughtful vigneron from Penedès who also teaches upcoming sommeliers in Barcelona. He took over his grandfather’s tiny old-vine plots of Xarel-lo in 2004. His three precise, graceful Xarel-los are the wines I’ve used most to punk guests seeking white Burgundy in the last year, especially his old-vine cuvée Nun. Alta Alella, specifically the Celler de les Aus project, also in Penedès, produces delicate zero-sulfur sparkling and still wines; its Brut Nature Bruant Cava is a seafoamlike stunner. Another fascinating Cava producer is Clos Lentiscus in Penedès. It was founded in 2002 by a third-generation, cheery farmer, Manel Avinyó, who makes an extensive range of biodynamic Cava from indigenous varieties, including a singular Sumoll “rosé” Cava that is downright feral. When you’re missing the heartiness of Rioja but want something less oaky or rich, Venus “La Universal” from Montsant is perfect. Sara Pérez and René Barbier, a couple who are both from well-known winemaking families in Priorat, make wines predominantly from Cariñena and Garnacha, sourced from organic vineyards and granitic soils. Their flagship wine, Venus, is textural and elegant. For Priorat reds that also avoid the modern, saturated style, check out Terroir al Limit in Priorat, which was founded in 2004 by the German-born Dominik Huber. He uses Austrian foudre and frequently employs whole-cluster fermentation in an attempt to make the reds of the region more elegant than those of his neighbors. The 100 percent Garnacha cuvée Les Manyes is a fine and mineral expression of what can be done in Priorat. Empordà is one of the region’s appellations you’re least likely to have heard of—Carles Alonso of Carriel dels Vilars here has been crafting savage wines since 1979 from a remote 2.5 hectares of bush-trained vines. His red blend of Garnacha, Cariñena, Cabernet Sauvignon, and Syrah is the most garrigue-laced, rawhide-tasting red I know in the entirety of Catalonia. Amanda Smeltz works as a sommelier in New York City. She spent several years as the wine director of Roberta’s Pizza and Blanca in Brooklyn and a year as the head sommelier for two Daniel Boulud restaurants. She is also the author of the poetry collection Imperial Bender.